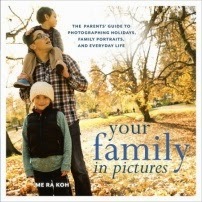 Your Family in Pictures: The Parent's Guide to Photographing Holidays, Family Portraits, and Everyday Life by Me Ra Koh is a guidebook of 40 "recipes" for taking your photos to the next level. "Capturing your family in pictures is about creating a legacy to leave behind -- a legacy that comes from a place of love and has the power to change the world" (p. xiv). I love that Koh says that you don't have to spend money on special equipment, and that even your phone is okay to use. She reinforces the idea that recording the memory is most important, and that "the best camera is the one you have with you" (p. 31). She suggests keeping a camera out and handy all the time so you can grab those spur of the moment opportunities. After walking readers through the basics, Koh offers tips for photographing your family with her "photo recipes" for holidays, family portraits, tweens and teens, and family vacations and travel. For each recipe, she gives specifics for both point and shoot and DSLR cameras, as well as telling readers what specific settings were used on her camera for the example photo. She really takes the guesswork out of photography for anyone, no matter their photography experience level. I would have love to have this book when my kids were babies, but the book isn't geared toward baby photos, and there is a nice mix of ages and subjects to make Your Family in Pictures a valuable resource for anyone.